Eileen Mayo established a career as an artist and teacher in England before emigrating to Australia in 1953. She first made prints in 1928 with the encouragement of Claude Flight, producing wood engravings and linocuts as well as book illustrations and lithographs. She was a member of the Society of Wood Engravers, founded in England in 1920 by a group of artists including Gwen Raverat and Eric Gill, key figures in the resurgence of wood engraving in modern British art in the 1920s. Mayo was a particular admirer of Gill, as much for his work as for his spiritual inclinations. Wood engraving complemented her meticulous approach and her inclination to work on a small scale. 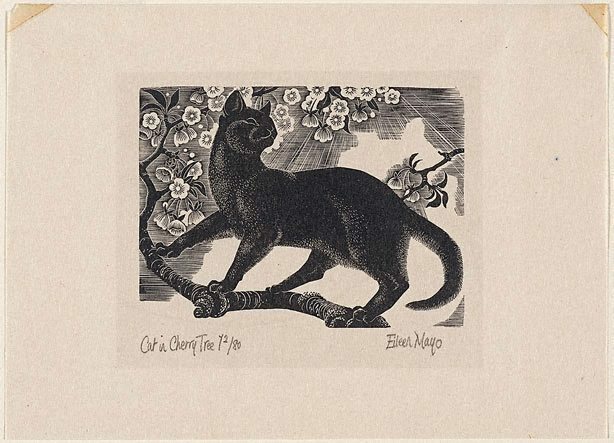 She lived in the countryside during the war, and her subjects reflected her environment and love of nature, as she made many drawings of animals and plants that were later developed into prints, such as 'Cat in cherry tree'. Signed l.r., pencil "Eileen Mayo". Not dated.